Oakleys is a 15th century grade II listed oak framed cottage built around 1485, and is actually half of a medieval Hall House. It is cosy, romantic and full of historic atmosphere and character. Modern luxury in a classic period setting with free wifi, comfortable beds with high quality linen and we are dog friendly too. Oakleys also has a private sauna house with walk in shower installed in the old wash house in the garden, if this is appealing contact us to book when you make your reservation for Oakleys and we will provide fluffy robes and extra towels for a truly spa like experience. Hall Houses were so called as they had a centre hall which had an open fire for warmth and cooking in the centre of the room on the compacted earth floor. Originally there was no chimney, it was added together with the inglenook fireplace probably in the 16th century. The smoke from the fire would rise up and exit through the roof and Oakleys roof timbers are still blackened from the soot of those fires. The carved oak joists in the living room were also added in the 16th century and it has been suggested that such carvings would indicate the owner was reasonably wealthy, possibly a wool merchant. You can see the original taper burns on the right hand side of the beam over the fireplace, which are thought to be charred marks from candles or rush-light tapers used to see when cooking over the fire. Some have even suggested that these are of ritualistic origin or to ward away evil spirits. In 2001 we built the kitchen and garden room extension, installing a new central heating system with underfloor heating to the dining room, garden room and kitchen, creating a luxurious and spacious property, resulting in five star luxury in a historic setting. Oakleys is set in the heart of the quiet rural hamlet of Foxearth, which has a beautiful church and is the centre of many country walks surrounded by open farmland and woodlands, many of which are ancient pathways of old. Foxearth is a short drive away from the villages of Pentlow, Long Melford and Clare where there are many good country pubs and restaurants. The Pinkuahs Arms in Pentlow is within walking distance on a sunny evening, being around one and a half miles either by footpaths across the fields or by country lanes. From the road in the village there is a pretty front garden with a large log store and parking for 2 cars. You enter the house through a small hall and into an atmospheric dining room with lots of ancient oak beams and some original wattle and daub walls. There is a large oak dining table and dresser which houses the white bone china crockery, cutlery and place mats. This room also has a cosy reading snug area built in around the front window and a sound system with speakers that are connected through to the kitchen so the cook gets to enjoy the music too. The flooring throughout the ground floor is Tudor brick, with underfloor heating to all ground floor rooms except the sitting room where there are radiators and the wood burning stove. Off the dining room are both the kitchen and the large sitting room. The kitchen is large and very well equipped with a dishwasher, washing machine, massive Maytag American fridge freezer, double induction hob over twin ovens, good preparation work top, a pretty ceramic sink, plenty of useful cupboard space, and lots of light through the windows looking out onto the rear garden. The sitting room has a lovely ancient moulded beam ceiling and a large Inglenook fireplace which houses the wood burner. There are three comfortable sofas and a large bookcases with a collection of reference books and games. There is a large Freeview HDTV discreetly hidden inside a pretty custom made oak cabinet with dvd player and a hifi system with iPod connectivity on the bookcase. The garden room is off the sitting room, an ideal spot for relaxing with a coffee and a good book or watching the many birds that visit the garden. It has fitted pine pews where everyone can sit and chat and a large coffee table. There is a retractable clothes line in the garden for drying clothes and folding airers in the main bedroom wardrobe if the weather is wet. Stand them in the garden room and the under floor heating dries your clothes in no time at all. There is a small hallway leading back to the garden room, downstairs loo, the garden and up the staircase onto a large landing. There is a sauna house installed in the old wash house in the garden which you can book with us for an extra charge of £70 to cover energy, laundry and housekeeping. On the landing is one of the built in Breton beds which is 3 foot 6 wide and 6 foot 5 long and can be closed off with heavy curtains and has a TV with built-in DVD, window and shelving. From the landing is the bathroom, master bedroom, garden bedroom and front bedroom. The master bedroom has a vaulted pine ceiling with a king size bed and views over the back garden and out to the open countryside. It has ample storage and double built in wardrobes and cupboards. The garden bedroom has a double bed with original lime plaster walls and oak floorboards, large chimney stack and dormer window which looks out onto the garden. There is a built in wardrobe with plenty of hanging space and room for luggage. The front bedroom also has the original old lath and plaster walls and oak floorboards. The second four foot wide built-in Breton bed (suitable for one adult or 2 small children) gives the room lots of character with steps to make it easy to get up into and again has its own curtains, TV and DVD player and shelving. This bedroom has an oak wardrobe and chaise longue, and looks out over the front garden and onto the village. The bathroom has a bath, wash basin, loo, large airing cupboard and heated towel rail and a separate large, modern walk in shower. All of our beds are as comfortable as we can make them with hotel quality linen made from Egyptian cotton and the mattresses are very comfortable. This is a feature that is very important to us as we know from our own experience that a good night’s sleep means you will enjoy your holiday all the more. Towels and bath mats are also provided. The back garden of Oakleys has a large terrace with a table and chairs and outside lighting with space to eat outside comfortably. The walled garden has plenty of shady spots from the fruit trees and shrubs with a further BBQ area with seating under a rose covered pergola. Logs are available during the winter. We are happy to accommodate up to two well trained dogs, we are dog owners ourselves and wouldn’t leave home for long without them. We do ask that dogs are not allowed upstairs as this keeps the bedrooms a dog free zone for all our guests. We can provide poo bags, dog beds and dog blankets, just ask our housekeeper or help yourselves from the garden shed and cupboard by the front door. Free wifi available and a landline that accepts incoming calls so you can stay connected. William and Karen and daughter Rachael lived at Oakleys Cottage until 2006. We had a wonderful time at Oakleys and it is a special place to us so that we were unable to part with it when we relocated to Scotland and then again to Yorkshire. We still visit often and always enjoy the wonderfully cosy historic atmosphere of this lovely house. We hope our guests will too. Oakleys is cosy and comfortable and still has many of the original features from when it was first built in 1485. This was when Henry 7th ruled England and beat Richard the third, imagine that! The village of Foxearth is very pretty with lots of period cottages giving it the feeling that time stood still. Great for a walk around the old church which houses a heritage centre and still has services regularly. We love the privacy of the walled garden which also means our dogs can run freely The garden is a sun trap and is sheltered by the fruit trees and shrubs we planted about 15 years ago. It is also magical on a warm summer evening for eating outside. The kitchen has old world character but is very well equipped with modern induction hobs and two ovens, great for cooking and entertaining. The beds are really comfortable with Egyptian cotton linen and extra deep mattresses. Two of the beds are built in Breton beds with their own personal tv and dvd player, great for children who want to do their own thing or grown ups selling some quiet time on their own. You can draw the curtains and be in your own luxurious, cosy world. In winter Oakleys comes to life with a wood burning stove in the centre of the huge, original inglenook fireplace making the room glow. The bathroom has oak beams but also a very modern walk in shower and a bath big enough to stretch out and relax in. There are some wonderful walks right from the front door which are great at any time of year and mean you can really relax leaving the car on our long front drive. Some of the reasons why we could not bring ourselves to sell. The main bathroom has a large walk in shower, heated towel rail, spacious airing cupboard and bath with shower attachment, toilet and wash basin. There is a downstairs toilet in the house. An additional toilet, wash basin and walk in shower is available as part of the sauna house a few paces from the back door which is booked at an extra cost of £70, this covers unlimited use, extra towels and fluffy bath robes, please contact the owner if you wish to book it. Underfloor heating to dining room, kitchen and garden room, with radiators to other rooms. Large Maytag American fridge freezer. Six ring induction hob. Suitable pans provided. Two multifunction ovens, side by side. The walled garden is secure for dogs and is mainly lawn and fruit trees with some roses and honeysuckle for fragrant summer evenings. There are potted herbs on the terrace for cooking. We have stayed at this property for a number of works. 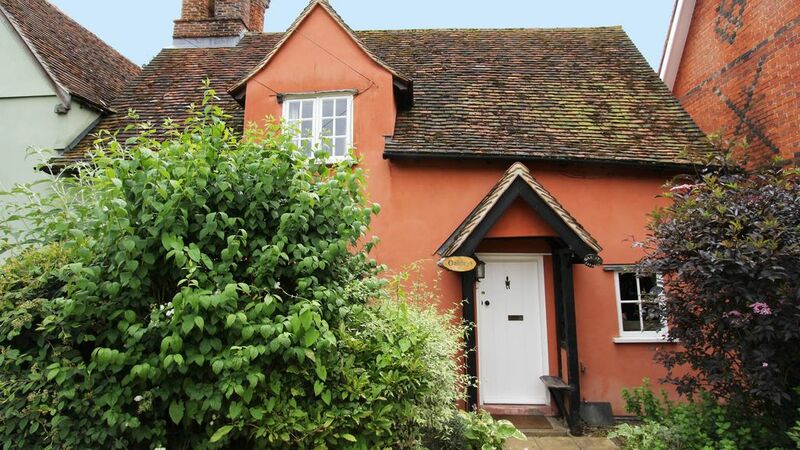 Lovely cottage with lots of character, and well equipped. It's like a home from home. We have just returned from a five night stay at Oakleys and could not have asked for a more wonderful stay. The property is bursting with character and extremely tastefully furnished throughout. The house blends old and new beautiful. The main old house include a spacious lounge compete with a wonderful inglenook fireplace, a dining room with long, comfortable table and low lighting and cosy bedrooms including two fantastic built in beds for little people (a huge hit with ours!). The newer extensions compliment this perfectly allowing a more light filled area to the rear to the house including a very large and extremely well equipped kitchen and a lovely reading room from which to watch life in the garden. We thoroughly enjoyed our stay and found the property worked really well for us as both a base to explore from and a base to simply relax and potter in. We choose this cottage for our annual family weekend away and it was just perfect. The cosy historical feel of the property together with the ideal location lent itself to be a weekend to remember. We enjoyed our stay the cottage is warm and has everything you need. The children loved the beds in the eaves and the dog was happy in the garden. We all had a very enjoyable Christmas and loved all the nooks and crannies. The kitchen had everything we needed and the shower was powerful. Lovely place to stay at with great beds and the house equipped with all comforts. It's a little dark at night due to the vintage lighting, but that adds to the overall look and feel of the cottage. We visit family in Suffolk every year just before Christmas. This year we decided to have a space of our own and what a great decision! The cottage was perfect - very homely and exceptionally well equipped. We settled in quickly and loved the spacious living room with wood burner. We had a very comfortable few days and will certainly be returning. Thank you for the lovely feedback, glad you enjoyed your stay and you are very welcome to come back to us. Oakleys Cottage is set in the delightfully rural village of Foxearth, close to Long Melford with a wealth of antique centres, restaurants and country pubs which is in walking distance via a footpath across open fields for 2 miles or reached by car in a few minutes. Long Melford has two famous country houses, Kentwell Hall with its medieval recreations throughout the year and Melford Hall (National Trust), both stunning period houses open to the public. The nearest historic town of Sudbury has a regular market selling fruit, vegetables and other merchandise and the town boasts many period buildings, shops and restaurants as well as all the facilities needed such as Banks, Library and Tourist Information Centre as well as the famous Gainsborough's House and a Leisure Centre with a fully equipped gym and pool and the Quay theatre situated by the lovely River Stour. The Essex and Suffolk coastlines make a wonderful day trip with a choice of quiet seascapes with bird watching and walking or a fun day out with all the attractions of a seaside resort at Frinton or Clacton with its pier and fun fair.